Arthur is a legendary British "king" of mythical proportions. Although his historicity is controversial, he ranks as one of the 100 Greatest Britons of all times. The popularity of the stories of King Arthur have captured interest far beyond his being the legendary hero of one nation. Countless new legends, stories, revisions, books, and films have been produced in Europe and the United States that unabashedly enlarge on and expand the stories of King Arthur. The historical background to Arthur is extremely scarce. From a fifth or sixth century war chief, he eventually developed into a mythic warrior of heroic legend, eventually evolving into the familiar archetype of Christian chivalry and the tragic victim of courtly love between his beautiful wife and his most outstanding knight. The legendary Arthur developed initially through the pseudo-history of Geoffrey of Monmouth and the Welsh collection of anonymous tales known as the Mabinogion. The French writer Chretien de Troyes began the literary tradition of Arthurian romance. Medieval Arthurian writing reached its conclusion in Thomas Mallory's comprehensive Morte D'Arthur, published in 1485. 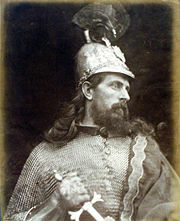 Modern interest in Arthur was revived by Tennyson in Idylls of the King. The central themes of the Arthurian cycle vary depending on which texts are examined. 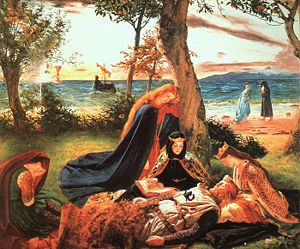 However, they include the establishment of Arthur as king through the sword in the stone episode, the advice of the wizard Merlin, the establishment of the fellowship of knights known as the Round Table and the associated code of chivalry, the defense of Britain against the Saxons, numerous magical adventures associated with particular knights, the enmity of Arthur's half-sister Morgan Le Fay, the quest for the Holy Grail, the adultery of Lancelot and Arthur's Queen Guinevere, the final battle with Mordred, and the legend of Arthur's future return. 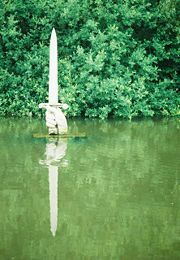 The magical sword Excalibur, the castle Camelot, and the Lady of the Lake also play important roles. A notable stylistic aspect of medieval Arthurian literature is that it is invariably anachronistic, applying the conventions of chivalric Christian society onto a much earlier era. Contemporary re-workings, however, typically employ a medieval or Dark Ages context. The origin of the name Arthur is itself a matter of debate. Some suggest it is derived from the Latin family name Artorius, meaning "ploughman" (the variant "Arturius" is known from inscriptions). Others propose a derivation from Welsh arth (earlier art), meaning "bear," suggesting art-ur, "bear-man," is the original form. Arthur's name appears as Arturus in early Latin Arthurian texts, never as Artorius, although it is possible that Vulgar Latin forms of Artorius, pronounced in Celtic languages, could have yielded both Arthur and Arturus. Toby D. Griffen of Southern Illinois University links the name Arthur to Arcturus, the brightest star in the constellation Boötes, near Ursa Major, or the Great Bear. The Classical Latin Arcturus would have become Arturus in Vulgar Latin, and its brightness and position in the sky led people to regard it as the "guardian of the bear" and the "leader" of the other stars in Boötes. Griffin suggests that "Arthur" was not a personal name, but a nom de guerre or an epithet borne by the man who led the Britons against the Saxons, which both Latin and Brythonic-speakers would associate with leadership and bear-like ferocity. A variant of the nom de guerre theory has the name combining the Welsh and Latin words for "bear," "art", and "ursus." Another suggestion is that the name was bestowed on him by the Saxons, ar thur, meaning "the eagle of Thor." The name Arthur and its variants were used as personal names by at least four leaders who lived after the traditional dates of Arthur’s battles, suggesting to Griffen and others that it only began to be used as a personal name after "the" Arthur made it famous. The historicity of the King Arthur legend has long been debated by scholars. Early references to him lack details and seem to describe him as a war chief, but not necessarily as a king. One school of thought sees Arthur as a shadowy historical figure, a Romano-British leader fighting against the invading Anglo-Saxons sometime in the late fifth to early sixth century. The Historia Brittonum, a ninth century Latin historical compilation attributed to the Welsh cleric Nennius, gives a list of 12 battles fought by Arthur, culminating in the Battle of Mons Badonicus, where he is said to have single-handedly killed 960 men. The tenth century Annales Cambriae ("Welsh Annals"), dates this battle to 516. It also mentions the Battle of Camlann, in which it says Arthur and Medraut were both killed, in 537. Neither text refers to Arthur as a king, although actual kings are indeed mentioned in these texts without mentioning their titles. The Historia Brittonum calls him dux bellorum or "commander of battles." Gildas' sixth-century polemic De Excidio Britanniae (On the Ruin of Britain), written within living memory of the Battle of Mons Badonicus, speaks of the battle but does not mention Arthur. Another school of thought argues that Arthur has no historical existence, based on the fact that the above accounts are several centuries after the fact and no evidence from the actual period in question mentions Arthur. Nowell Myres wrote that, "no figure on the borderline of history and mythology has wasted more of the historian's time." 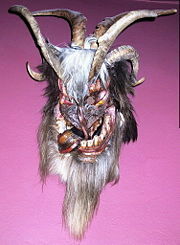 Some argue that Arthur was originally a half-forgotten Celtic deity that devolved into a personage, citing parallels with the supposed change of the sea-god Lir into King Lear, as well as the Kentish totemic horse-gods Hengest and Horsa, being historicized by the time of Bede's account and given an important role in the fifth century Anglo-Saxon conquest of eastern Britain. 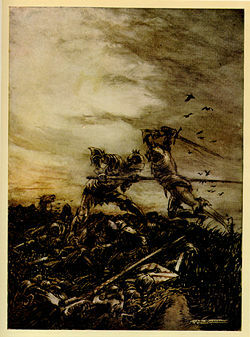 The Norse demigod Sigurd, or Siegfried, was historicized in the Nibelungenlied by associating him with a famous historical fifth century battle between Huns and the Burgundians. Some cite a possible etymology of Arthur's name from Welsh arth, "bear," and propose the Gaulish bear god Artio as a precedent for the legend of Arthur. Various sites and places have been identified as "Arthurian" since the twelfth century, but archeology can reveal names only through inscriptions. Among them are the so-called "Arthur stone" discovered in 1998, in a securely dated sixth century context among the ruins at Tintagel Castle in Cornwall and a non-religious, high-status settlement of sub-Roman Britain, thought by some to be Camelot. A number of identifiable historical figures have been suggested as the historical basis for Arthur, including Lucius Artorius Castus, a Roman officer who served in Britain in the second century; Roman usurper emperors such as Magnus Maximus; and sub-Roman British rulers like Riothamus and Ambrosius Aurelianus. The creator of the familiar literary persona of Arthur was Geoffrey of Monmouth, with his pseudo-historical Historia Regum Britanniae ("History of the Kings of Britain"), written in the 1130s. All the textual sources for Arthur are divided into those that preceded Geoffrey and those that followed him, and thus could not avoid his influence. Over the centuries, Arthurian legends took on a increasingly civilized tone, reflecting the Christianization of Britain and the later emergence of chivalry and courtly love. The Historia Brittonum mentions Arthur hunting a boar named Troynt. This may be related to a tradition of Arthur as leader of the Wild Hunt, first mentioned in the thirteenth century by Gervase of Tilbury. The earliest literary references to Arthur, however, are found in Welsh poetry. He is mentioned briefly in the late-sixth century Welsh poem cycle The Gododdin, attributed to the poet Aneirin. In one verse, the bravery of one of the warriors is described, "though he was not Arthur." The poems are known only from a manuscript of the thirteenth century, so it is impossible to determine whether this passage is original or a later interpolation. 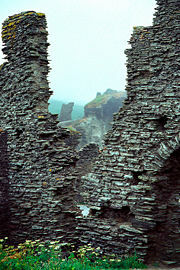 Several poems attributed to Taliesin, a poet said to have lived in the sixth century, refer to Arthur, including The Chair of the Sovereign, which refers to "Arthur the Blessed;" The Treasures of Annwn, which recounts an expedition of Arthur to the Otherworld; and Journey to Deganwy, which contains the passage, "as at the battle of Badon, with Arthur, chief holder of feasts, his tall blades red from the battle all men remember." Arthur appears in a number of well-known vitae ("lives") of sixth-century saints, most of them written at the monastery of Llancarfan in the twelfth century. In the Life of Saint Illtud, apparently written around 1140, Arthur is said to be a cousin of the saint. According to the Life of Saint Gildas, written in the eleventh century by Caradoc of Llancarfan, Arthur killed Gildas' brother Hueil, a pirate, on the Isle of Man. In the Life of Saint Cadoc, written around 1100 by Lifris of Llancarfan, the saint gives protection to a man who killed three of Arthur's soldiers, and Arthur demands a herd of cattle as wergeld (reparation) for his men. Similar incidents are described in the late medieval biographies of Carannog, Padern, Goeznovius, and Efflam. An early Welsh poem found in the Black Book of Carmarthen, Pa gur yv y porthaur? ("What man is the gatekeeper? "), takes the form of a dialogue between Arthur and the gatekeeper of a castle he wishes to enter, in which Arthur recounts the deeds of his men, notably Cai and Bedwyr. The tenth century Welsh prose tale, Culhwch and Olwen, included in the modern Mabinogion collection, includes a list of more than 200 of Arthur's men, Cai and Bedwyr included, and tells of Arthur helping his kinsman Culhwch win the hand of Olwen, daughter of Ysbaddaden the giant, by completing a series of apparently impossible tasks, including the hunt for the great boar Twrch Trwyth. The Welsh Triads contain a number of traditions of Arthur. Many are derived from Geoffrey of Monmouth and later European traditions, but some are independent of these and may refer to pre-existing Welsh traditions. His court is placed at Celliwig in Cornwall, identified with Callington by the Cornish antiquarians, but Rachel Bromwich, editor and translator of Trioedd Ynys Prydein: the Welsh Triads, identifies it with Kelly Rounds, a hill fort in the parish of Egloshayle. Bewnans Ke, a play in Middle Cornish held by the National Library of Wales, is a recent Arthurian discovery. 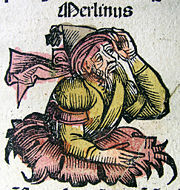 The figure of Merlin and many other familiar Arthurian characters was introduced by Geoffrey of Monmouth. The first narrative account of Arthur's reign is found in Geoffrey of Monmouth's twelfth century Latin work, Historia Regum Britanniae, an imaginative and fanciful account of British kings from the legendary Trojan exile Brutus to the seventh century Welsh prince Cadwallader. Geoffrey places Arthur in the same post-Roman period as do the Historia Brittonum and Annales Cambriae. He introduces Arthur's father, Uther Pendragon, and his magician adviser Merlin, as well as the story of Arthur's conception, in which Uther, disguised as his enemy Gorlois by Merlin's magic, fathers Arthur on Gorlois' wife Igerna at Tintagel. On Uther's death, the 15-year-old Arthur succeeds him as king and fights a series of battles, similar to those in the Historia Brittonum, culminating in the Battle of Bath. He then defeats the Picts and Scots, conquers Ireland, Iceland, Norway, Denmark, and Gaul, and ushers in a period of peace and prosperity which lasts until the Roman emperor Lucius Tiberius demands tribute. Arthur refuses, and war follows. Arthur and his warriors, including Caius, Bedver, and Walganus—later known as Kay, Bedivere, and Gawain—defeat Lucius in Gaul. As Arthur prepares to march on Rome, he hears the news that his nephew Modredus (Mordred), whom he had left in charge of Britain, has married his wife Guanhumara (Guinevere) and seized the throne. Arthur returns to Britain and kills Modredus in battle on the river Camblam in Cornwall, but is mortally wounded. He hands the crown to his kinsman Constantine III of Britain, and is taken to the isle of Avalon to be healed of his wounds, never to be seen again. Geoffrey's Historia became very popular and influential, and was translated into Norman French verse by Wace, who introduced the Round Table. It fed back into Welsh tradition, with three different Welsh prose translations appearing, and material in the Welsh triads deriving from it. The characters of Lancelot and Guinevere were introduced by the French poet Chrétien de Troyes. The popularity of Geoffrey's Historia and its derivative works led to new Arthurian works being written in continental Europe, particularly in France, in the late twelfth and early thirteenth century. Arthur appears in some of the lais of Marie de France, but it was the work of another French poet, Chrétien de Troyes, that had the greatest influence. Chrétien wrote five Arthurian romances between 1170 and 1190. Erec and Enide and Cligès are tales of courtly love with Arthur's court as their backdrop, and Yvain features Gawain in a supernatural adventure, but the most significant for the development of the legend are Lancelot, the Knight of the Cart, which introduces Lancelot, one of the most familiar of Arthur's knights, and his adulterous relationship with Arthur's queen, Guinevere, and Perceval, which introduces the Holy Grail and the Fisher King. Perceval, although unfinished, was particularly popular, and four separate continuations of the poem appeared over the next half a century. In Chrétien's Perceval it is not clear exactly what the Grail is. A few decades later, Robert de Boron's poem Joseph d'Arimathe explains that the Grail is the cup used by Joseph of Arimathea to catch Christ's blood during the crucifixion, later brought to Britain by Joseph's family. By contrast, in Wolfram von Eschenbach's Parzival, a Middle High German version of the story, the Grail is a magical stone. A German poet, Ulrich von Zatzikhoven, further developed Lancelot's story in his Lanzelet, which introduces the Lady of the Lake. The Anglo-Norman poet Thomas of Britain and the Norman poet Béroul introduced the story of Tristan and Iseult in the late-twelfth century, later developed in Middle High German by Gottfried von Strassburg. The Welsh Mabinogion collection contains three Arthurian romances, similar to those of Chrétien, but with some significant differences. Owain, or the Lady of the Fountain is related to Chrétien's Yvain, Geraint and Enid to Erec and Enide, and Peredur son of Efrawg to Perceval, although the place of the Holy Grail is taken by a severed head on a platter. A series of five Middle-French prose works, the Estoire del Saint Grail, the Estoire de Merlin, the Lancelot propre, the Queste del Saint Graal, and the Mort Artu, written in the thirteenth century, combine to form the first coherent version of the entire Arthurian legend, known as the Lancelot-Grail cycle, the Prose Lancelot, or the Vulgate Cycle. These texts introduce the character of Galahad, expand the role of Merlin, and establish the role of Camelot, first mentioned in passing in Chrétien's Lancelot, as Arthur's primary court. The Suite du Merlin or Vulgate Merlin Continuation adds more material on Merlin and on Arthur's youth, and a later series of texts, known as the Post-Vulgate Cycle, reduces the importance of Lancelot's affair with Guinevere, which was prominent in the Vulgate. The development of the Arthurian cycle culminated in Le Morte d'Arthur, Thomas Malory's retelling of the entire legend in a single work, in English, in the late-fifteenth century. Malory based his book on the various previous versions, in particular the Vulgate Cycle, and introduced some material of his own. Le Morte D'Arthur was one of the earliest printed books in England, published by William Caxton in 1485. The legend of King Arthur has remained popular into the twenty-first century. Though the popularity of Arthurian literature waned somewhat after the end of the Middle Ages, it experienced a revival during the nineteenth century, especially after the publication of Alfred Lord Tennyson's Idylls of the King. Key modern re-workings of the Arthurian legends include Mark Twain's A Connecticut Yankee in King Arthur's Court, T.H. White's The Once and Future King, and Richard Wagner's opera Parsifal. The subsequent period saw the creation of hundreds, perhaps thousands of books, poems, and films about King Arthur, both new works of fiction and analyses of the relevant historical and archaeological data. Timeless Myths – King Arthur. www.timelessmyths.com. The Legends of King Arthur. www.cornwalltour.co.uk. The Medieval Development of Arthurian Literature. www.bbc.co.uk. This page was last modified on 18 April 2016, at 14:26.